Guest blogging is a great way to; drive traffic to your sites, reach a new audience, sell more books and build your reputation as part on an on-going marketing strategy or as part of a scheduled virtual tour. Approaching it in the right way will make a big difference in the success you have and increase your chances of being invited back for future features. 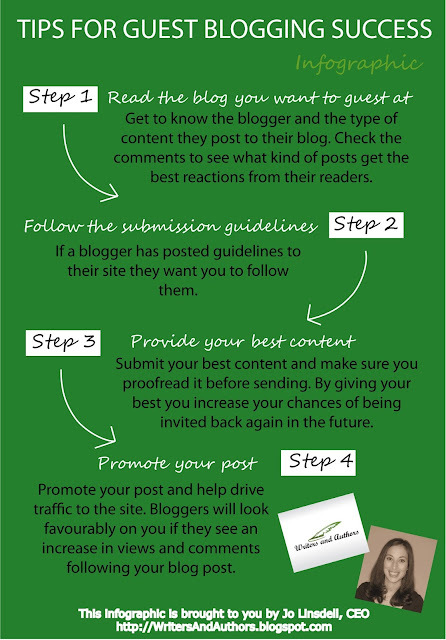 Do you have some of your own tips about guest blogging or know of some great sites that are accepting guest posts? Share in the comments section. These are outstanding tips on guest blogging success. Thanks for your helpful tips.